Weinor has recently launched the new VertiTex II. A compact, vertical awning, the VertiTex II by Weinor is a fantastic option for shading from the sun. The unobtrusive design creates an elegant awning that can be applied in a number of applications, including patio roofs, windows, conservatories and more. Available in widths of up to 6 meters, the VertiTex is suitable for various requirements you may have – it can be fitted virtually anywhere! – Rail: The fabric is guided in a rail, the standard, universal option. – Rope: Guided by a rope, this is the light version, and the most aesthetically delicate. 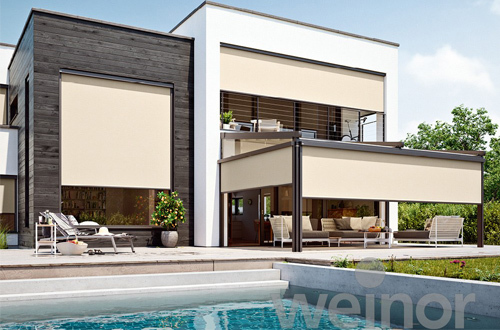 Weinor’s extensive fabric colours, patterns and material designs, as well their offering of over 200 frame colours mean you are able to own the most ideal vertical awning that is perfect for your home’s façade.